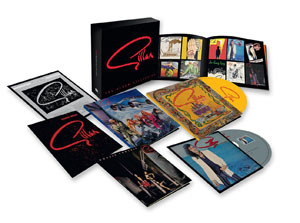 Share the post "Album review: GILLAN – The Albums Collection"
It is evident from these albums that singer Ian Gillan had an amazing band that, for whatever reasons, worked incredibly well. Several top 10 albums and singles for a start. As bassist John McCoy recently told me, they had the best singer in the rock business, who just needed a kick up the bottom. I’m inclined to agree; the chemistry was explosive! This new collection, bringing together six albums in facsimilie sleeves but omit the bonus tracks that appeared on the 2007 Edsel reissues. After leaving Deep Purple for the first time, Ian dabbled in various projects before forming the jazz fusion oriented Ian Gillan Band. 1978 saw the formation of Gillan, with only pianist Colin Towns staying on. Only bassist John McCoy remained from ‘The Japanese Album’, and Mr Universe was the Gillan Band’s UK debut, adding drummer Mick Underwood and guitarist Bernie Tormé. Unlike Rainbow, PAL and Whitesnake, Gillan really moved away from the Deep Purple template in a big way, the music fiery and explosive. Towns’ keyboards moved from intricate to lead and back, Bernie’s guitar mixing punk and Hendrix, and the Underwood/McCoy rhythm section solid and heavy. 1980′s Glory Road was originally a double album and has a bigger Tormé/McCoy influence. Opener ‘Unchain Your Brain’ is a classic riff as you’ll get, as is ‘Are You Sure?’. Riffs and solos combined, it is an essential album. Limited copies of the album included a bonus disc For Gillan Fans Only. It features A and B sides, and several studio jams and covers plus a solo track from Colin Towns (from an unreleased solo album), John and Bernie playing with drummer Thunderstick, and a track by the Split Knee Loons. ***** Future Shock, Bernie’s last album with the band, is another classic, and a more cohesive sound, with writing and performance more equally spread (neither keyboards nor guitar taking control, but working equally well together. Double Trouble followed quickly, originally as a double album (the second disc a live set), and featured ex-White Spirit guitarist Janick Gers (now of Iron Maiden). The studio side is solid, a very good set by normal standards but compared to Future Shock and Glory Road a little unspectacular. A couple of singles were raised, and the opener ‘I’ll Rip Out Your Spine’ is worth a listen and more. The lengthy ‘Born To Kill’ is Towns at his best. In fact on reflection it’s a damn good set, just a little different. The studio set finishes with the bonus track ‘Spanish Guitar’, first time on CD and previously only on a rare flexi disc. These albums really are essential listening and form an important part of British hard rock at its peak. The more intrepid may wish to seek out those earlier reissues with the bonuses and it is a shame that Edsel didn’t either add them or include an extra disc. This boxed set does go with the earlier singles collection (now unavailable) whilst a booklet (essayed by Joe Geesin) pads out this value-for-money quick-fix entree to the world of Ian Gillan at the turn of the 1970s. This entry was posted in ALBUM REVIEWS, ALBUM REVIEWS (Mobile), All Posts, Reissues and tagged album, Bernie Torme, Colin Towns, Deep Purple, Double Trouble, For Gillan Fans Only, Future Shock, Gillan, Glory Road, Ian Gillan, Janick Gers, John McCoy, Magic, Mr.Universe, reissue, review, The Albums Collection. Bookmark the permalink.